Spiced plum pudding in a glass: Crown Royal Cask No. 16 takes the normally sweet and simple genre of Canadian whiskey somewhere new and more sophisticated. Cask No. 16 is a stunningly beautiful dark bronze hazelnut color. I've never seen a darker more lovely dram. The aroma is sweet and rich with figs and prunes (sweet dried black fruits). There is a subtle floral and woody aroma too - with extended time in the glass. Entry is sweet and light, but expands beautifully on the tongue with figs, both fresh and dried, more floral perfume, nutmeg and allspice and toasted pecans. Finish is long and adds complexity with the wood showing up to add tannins' dryness to counter all the fig honey. Just lovely and yummy. I'm not a big fan of Canadian whiskey in general. I find it too sweet and too simple and the spirit flavor inadequately integrated with the grain sweetness (unlike sweet examples from Scotland, Ireland, and the USA which put the spirit better in the mix in my opinion). 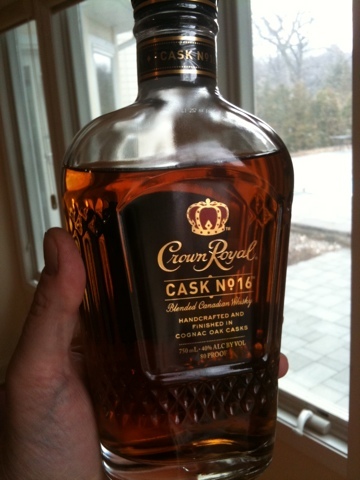 Crown Royal Cask No. 16 is an exception. It's sweet, sure, and there's spirit heat, indeed; but Cask No. 16 brings a wooded sophistication and mixes the figgy fruits with floral perfume and oaky vanilla in a way that is inescapably seductive. I didn't think I'd love this one - but I do. I LOVE it. Bravo, Crown Royal. They have elevated Canadian whiskey and produced something that can stand with the great spirits of the world. Does anyone know of the value if not just for conversation, of old unopened bottles of Crown Royal....?....I have one from 1954 in the bag and in a box. Just curious. (select "World" from the categories on the left - and then "Canada" in the "Distilleries/brand name" drop down field. Then enter "crown royal" in the "description" field and click the "search" button. I see a bunch from the 60s and 70s that seem to go from 16-60 euros (depending on condition and presence of bag and box). So, not a ton of money. The oldest one seem to be a 1959 without either box or bag and it brought 27 euros). The highest price for any of them was a 1966 in box and bag for 67 Euros. Yours, older and with box and bag would be worth more - but I don't know how much. Thanks so much for your post! Appreciated it! Hats off!